Among the 2,691 adults surveyed by the Pew Research Center last month, 39% say marriage is becoming obsolete, up from 28% who responded to the same question posed in 1978 by Time magazine, which participated in the survey. "If four in 10 are saying it's becoming obsolete, they're registering an awareness of a very important social change," says Paul Taylor of Pew. "It doesn't necessarily mean marriage is about to disappear or has disappeared." Census data reflect a declining percentage of married adults: 54% in 2010, down from 57% in 2000 and 72% in 1960. At the same time, the median age at first marriage increased in 2010 to its highest ever — 28.2 for men and 26.1 for women, according to Census. That's up from 26.8 and 25.1 in 2000. Among those ages 25-34, the percentage of those who are married fell below unmarrieds for the first time in more than a century. Stephanie Coontz, professor of history and family studies at Evergreen State College in Olympia, Wash., was among four scholars who consulted with Pew. "The relationship of marriage is taken more seriously than it used to be and it means more to people, but the institution is no longer as dominant," she says. 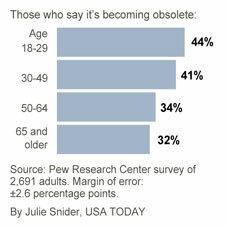 Still, " 'obsolete' is a big word. It's catchy, but I can't imagine that's going to happen," says Carl Haub, a demographer at the Population Reference Bureau, who was not involved in the report. Marriage is still the norm for college grads (64%) but less so for those with no college (48%). Blacks are much less likely to be married (32%) than whites (56%), the report finds. Cohabitation has nearly doubled since 1990. Pew found 44% of adults (and more than half ages 30-49) have cohabited. Among these, 64% say they considered it a step toward marriage. "People rightly recognize that marriage is no longer essential," Coontz says, but "the majority of Americans still value marriage very deeply."